Efe Bilgili poses with a figure he made from Legos. Eleven-year-old Efe Bilgili loved puzzles and Lego toy building blocks so much that it turned into a passion over time. The things that Efe built with his Legos were too much for his room. This is why a part of their house in Eskişehir province was separated for him. His father started to buy Legos and different puzzles for Efe, who is a sixth-grade student now, when he was only 2-years-old. Efe's passion turned toward Legos in time. Creating various shapes with the Legos that his family and relatives bought for him, Efe turned a part of their house into a kind of toy block workshop. Efe has interlocked nearly 100,000 pieces of Legos to date. 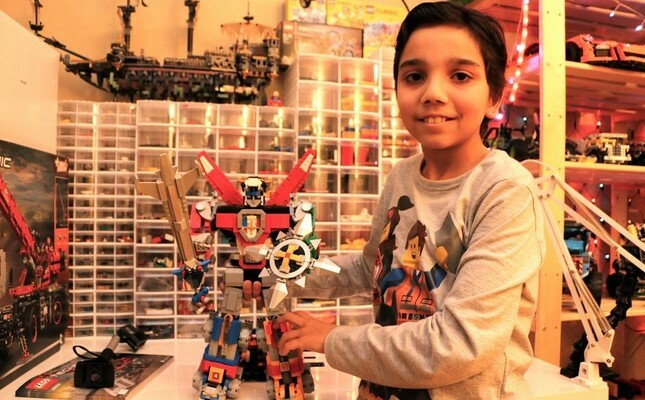 He shares videos on Instagram and YouTube with the nickname "Legoların Efendisi" (The Master of Legos), and these videos are watched in Turkey and Far East countries with interest. Speaking to Anadolu Agency (AA), Efe Efe implied that interlocking Legos is a passion for him and reported that whenever he gets a new box of Legos, he wants to open it immediately. Emphasizing that he has interlocked about 100,000 pieces of Legos to date, Efe continued, "I cannot separate any toy block pieces that I have built from others. I like all of them. When my friends see my creations with Legos, they are surprised. Sometimes, I bring some of them to school with me. My teachers also like it very much. I have some difficulties while joining some Legos. However, I can present a finished product in the end. I get excited when I connect every toy block as a new product will be created. Passion and curiosity encourage me to do them. My blocks are not a toy for me, they are a hobby. I am really happy when Legos are offered to me as a gift. I have been trying to move Legos with robotic coding recently. I want to work as a designer at a toy block company in the future." A carousel Bilgili made from Lego bricks. Efe's father, Fırat Bilgili, said that he started buying his son building toys when he was still a baby. He said that Efe began to solve puzzles and play with Legos when he was just 2 or 3 years old. Noting that they bought Legos for Efe later, the father remarked, "When he interlocked his Legos and enjoyed it, he started to not like other toys. The more he grows up the more beautiful work he creates with Legos. First, we determined an area for Legos in his room. In time, these toy block constructions expanded out of his room. Now, we have separated a part of a room in the house for his Legos. We turned this place into a kind of workshop where he can interlock and design blocks. He completes a toy block construction of 2,000-3,000 pieces in only one day. When he loves a construction, he completes it without interruption. We opened a YouTube channel with the nickname 'Legoların Efendisi' for him. Even if we do not have so many subscribers, people from Far East countries, like South Korea, watch his videos." Stressing that Legos have started to become an expensive hobby, he added, "It affects us economically to buy a new model each passing day." Efe's mother, Sevinç Bilgili highlighted that Legos are so important for their son and added that they clean and arrange the Legos with him. Stating that he lives a life integrated with Legos, the mother pointed out, "Efe's friends who visit our home do not want to leave. Sometimes, I exhibit my son's Legos in my display cabinet."